This article is about the 1958 crash of the aircraft carrying the Manchester United football team. For the 1960 accident, see 1960 Munich Convair 340 crash. The Munich air disaster occurred on 6 February 1958 when British European Airways Flight 609 crashed on its third attempt to take off from a slush-covered runway at Munich-Riem Airport, West Germany. On the plane was the Manchester United football team, nicknamed the "Busby Babes", along with supporters and journalists. Twenty of the 44 on the aircraft died at the scene. The injured, some unconscious, were taken to the Rechts der Isar Hospital in Munich where three more died, resulting in 23 fatalities with 21 survivors. The team was returning from a European Cup match in Belgrade, Yugoslavia, having eliminated Red Star Belgrade to advance to the semi-finals of the competition. The flight stopped to refuel in Munich because a non-stop flight from Belgrade to Manchester was beyond the "Elizabethan"-class Airspeed Ambassador's range. After refuelling, pilots James Thain and Kenneth Rayment twice abandoned take-off because of boost surging in the left engine. Fearing they would get too far behind schedule, Captain Thain rejected an overnight stay in Munich in favour of a third take-off attempt. By then, snow was falling, causing a layer of slush to form at the end of the runway. After the aircraft hit the slush, it ploughed through a fence beyond the end of the runway and the left wing was torn off after hitting a house. Fearing the aircraft might explode, Thain began evacuating passengers while Manchester United goalkeeper Harry Gregg helped pull survivors from the wreckage. An investigation by West German airport authorities originally blamed Thain, saying he did not de-ice the aircraft's wings, despite eyewitness statements to the contrary. It was later established that the crash was caused by the slush on the runway, which slowed the plane too much to take off. Thain was cleared in 1968, ten years after the incident. Manchester United were trying to become the third club to win three successive English league titles; they were six points behind League leaders Wolverhampton Wanderers with 14 games to go. They also held the Charity Shield and had just advanced into their second successive European Cup semi-finals. The team had not been beaten for 11 matches. The crash not only derailed their title ambitions that year but also virtually destroyed the nucleus of what promised to be one of the greatest generations of players in English football history. It took 10 years for the club to recover, with Busby rebuilding the team and winning the European Cup in 1968 with a new generation of "Babes". In April 1955, UEFA established the European Cup, a football competition for the champion clubs of UEFA-affiliated nations, to begin in the 1955–56 season; however, the English league winners, Chelsea, were denied entry by the Football League's secretary, Alan Hardaker, who believed not participating was best for English football. The following season, the English league was won by Manchester United, managed by Matt Busby. The Football League again denied their champions entry, but Busby and his chairman, Harold Hardman, with the help of the Football Association's chairman Stanley Rous, defied the league and United became the first English team to play in Europe. The team – known as the "Busby Babes" for their youth – reached the semi-finals, beaten there by the eventual winners, Real Madrid. Winning the First Division title again that season meant qualification for the 1957–58 tournament, and their cup run in 1956–57 meant they were one of the favourites to win. Domestic league matches were on Saturdays and European matches midweek, so, although air travel was risky, it was the only choice if United were to fulfil their league fixtures, which they would have to do if they were to avoid proving Alan Hardaker right. After overcoming Shamrock Rovers and Dukla Prague in the preliminary and first round respectively, United were drawn with Red Star Belgrade of Yugoslavia for the quarter-finals. After beating them 2–1 at Old Trafford on 14 January 1958, the club was to travel to Yugoslavia for the return leg on 5 February. On the way back from Prague in the previous round, fog over England prevented the team from flying back to Manchester, so they flew to Amsterdam before taking the ferry from the Hook of Holland to Harwich and then the train to Manchester. The trip took its toll on the players and they drew 3–3 with Birmingham City at St Andrew's three days later. Eager not to miss Football League fixtures, and not to have a difficult trip again, the club chartered a British European Airways plane from Manchester to Belgrade for the away leg against Red Star. The match was drawn 3–3 but it was enough to send United to the semi-finals. The takeoff from Belgrade was delayed for an hour after outside right Johnny Berry lost his passport, and the plane landed in Munich for refuelling at 13:15 GMT. The co-pilot, Captain Kenneth Rayment, was also a former RAF flight lieutenant and a Second World War flying ace. After joining the RAF in 1940, he was promoted to sergeant in September 1941. He was commissioned as a war substantive pilot officer a year later, and promoted to war substantive flying officer in May 1943. He shot down five German fighters, one Italian plane and a V-1 flying bomb. He was awarded the DFC in July 1943, and promoted to flight lieutenant in September 1943. After leaving the RAF in 1945, he joined BOAC in Cairo, before joining BEA in 1947. He had had experience with Vikings, Dakotas and the Ambassador "Elizabethan" class. Thain had flown the "Elizabethan"-class Airspeed Ambassador (registration G-ALZU) to Belgrade but handed the controls to Rayment for the return. At 14:19 GMT, the control tower at Munich was told the plane was ready to take off and gave clearance for take-off, expiring at 14:31. Rayment abandoned the take-off after Thain noticed the port boost pressure gauge fluctuating as the plane reached full power and the engine sounded odd while accelerating. A second attempt was made three minutes later, but called off 40 seconds into the attempt because the engines were running on an over-rich mixture, causing them to over-accelerate, a common problem for the "Elizabethan". After the second failure, passengers retreated to the airport lounge. By then, it had started to snow heavily, and it looked unlikely that the plane would be making the return journey that day. Manchester United's Duncan Edwards sent a telegram to his landlady in Manchester. It read: "All flights cancelled, flying tomorrow. Duncan." A few of the players were not confident fliers, particularly Liam Whelan, who said, "This may be death, but I'm ready". Others, including Duncan Edwards, Tommy Taylor, Mark Jones, Eddie Colman and Frank Swift, moved to the back of the plane, believing it safer. Once everyone was on board, Thain and Rayment got the plane moving again at 14:56. At 14:59, they reached the runway holding point, where they received clearance to line up ready for take-off. On the runway, they made final cockpit checks and at 15:02, they were told their take-off clearance would expire at 15:04. The pilots agreed to attempt take-off, but that they would watch the instruments for surging in the engines. At 15:03, they told the control tower of their decision. Rayment moved the throttle forward slowly and released the brakes; the plane began to accelerate, and radio officer Bill Rodgers radioed the control tower with the message "Zulu Uniform rolling". The plane threw up slush as it gathered speed, and Thain called out the plane's velocity in 10-knot increments. At 85 knots, the port engine began to surge again, and he pulled back marginally on the port throttle before pushing it forward again. Once the plane reached 117 knots (217 km/h), he announced "V1", at which it was no longer safe to abort take-off, and Rayment listened for the call of "V2" (119 knots (220 km/h)), the minimum required to get off the ground. Thain expected the speed to rise, but it fluctuated around 117 knots before suddenly dropping to 112 knots (207 km/h), and then 105 knots (194 km/h). Rayment shouted "Christ, we won't make it! ", as Thain looked up to see what lay ahead. The plane skidded off the end of the runway, crashed into the fence surrounding the airport and across a road before its port wing was torn off as it caught a house, home to a family of six. The father and eldest daughter were away and the mother and the other three children escaped as the house caught fire. Part of the plane's tail was torn off before the left side of the cockpit hit a tree. The right side of the fuselage hit a wooden hut, inside which was a truck filled with tyres and fuel, which exploded. Twenty passengers died on board, and three died later in hospital. Meanwhile, in the cabin, goalkeeper Harry Gregg was regaining consciousness, thinking that he was dead. He felt blood on his face and "didn't dare put [his] hand up. [He] thought the top of [his] head had been taken off, like a hard boiled egg." Just above him, light shone into the cabin, so Gregg kicked the hole wide enough for him to escape. He also managed to save some passengers. Captain Kenneth "Ken" Rayment. Co-pilot. Survived but suffered multiple injuries and died in hospital five weeks later as a result of brain damage. Vera Lukić, the wife of a Yugoslavian diplomat, and her baby daughter, Vesna. Both passengers were saved by Harry Gregg. At the time, Vera Lukić was pregnant with her son Zoran. The crash was originally blamed on pilot error, but it was later found to have been caused by slush towards the end of the runway, slowing the aircraft and preventing safe flying speed. During take-off, the aircraft had reached 117 knots (217 km/h), but, on entering the slush, dropped to 105 knots (194 km/h), too slow to leave the ground, with not enough runway to abort the take-off. Aircraft with tail-wheel undercarriages had not been greatly affected by slush, due to the geometry of these undercarriages in relation to the aircraft's centre of gravity,[notes 1] but newer types, such as the Ambassador, with nose wheel landing-gear and the main wheels behind the centre of gravity, were found to be vulnerable. The accident resulted in the imposition of operating limits for the amount of slush build-up permitted on runways. Despite this conclusion, the German airport authorities took legal action against Captain Thain, as the one pilot who had survived the crash. They claimed he had taken off without clearing the wings of ice, which caused the crash, despite several witnesses stating that no ice had been seen. De-icing the aircraft was the captain's responsibility, while the state of the airport's runways was the responsibility of the airport authorities, among whom there was widespread ignorance of the danger of slush on runways for aircraft such as the Ambassador. The basis of the German authorities' case relied on the icy condition of the wings hours after the crash and a photograph of the aircraft (published in several newspapers) taken shortly before take-off, that appeared to show snow on the upper wing surfaces. When the original negative was examined, no snow or ice could be seen, the "snow" in the original having been due to the sun reflecting off the wings, which was clarified when examining the negative rather than the published pictures which had been produced from a copy negative. The witnesses were not called to the German inquiry and proceedings against Thain dragged on until 1968, when he was finally cleared of any responsibility for the crash. As the official cause, British authorities recorded a build-up of melting snow on the runway which prevented the "Elizabethan" from reaching the required take-off speed. Thain, having been dismissed by BEA shortly after the accident and never re-engaged, retired and returned to run his poultry farm in Berkshire. He died of a heart attack at the age of 53 in August 1975. Twenty people, including seven of Manchester United's players, died at the scene of the crash. The 21st victim, Frank Swift, the journalist and former Manchester City goalkeeper, died on his way to hospital. Duncan Edwards died from his injuries on 21 February at the Rechts der Isar Hospital in Munich, and the final death toll reached 23 several days later when co-pilot Ken Rayment died as a result of serious head injuries. Johnny Berry and Jackie Blanchflower were both injured so severely that they never played again. Matt Busby was seriously injured and had to stay in hospital for more than two months after the crash, and was read his Last Rites twice. After being discharged from hospital, he went to Switzerland to recuperate in Interlaken. At times, he felt like giving up football entirely, until he was told by his wife, Jean, "You know Matt, the lads would have wanted you to carry on." That statement lifted Busby from his depression, and he returned by land and sea to Manchester, before watching his team play in the 1958 FA Cup Final. Meanwhile, there was speculation that the club would fold, but a threadbare United team completed the 1957–58 season, with Busby's assistant Jimmy Murphy standing in as manager; he had not travelled to Belgrade as he was in Cardiff managing the Welsh national team at the time. A team largely made up of reserve and youth team players beat Sheffield Wednesday 3–0 in the first match after the disaster. The programme for that match showed simply a blank space where each United player's name should have been. With seven players dead (Duncan Edwards died just over 24 hours later), and with only Harry Gregg and Bill Foulkes fit to play out of the surviving players, United were desperate to find replacements with experience, so Murphy signed Ernie Taylor from Blackpool and Stan Crowther from Aston Villa. Three players, Derek Lewin, Bob Hardisty and Warren Bradley, were transferred to United on short-term contracts by non-League club Bishop Auckland. Bradley was the only one of the three players to play for the first team, and the only one to sign a permanent contract. The remaining places in the team were filled by reserve players including Shay Brennan and Mark Pearson. In the aftermath of the crash, Manchester United's fierce rivals Liverpool (who would later be managed by Busby's good friend Bill Shankly) offered United five loan players to help them put a side together. Busby resumed managerial duties the next season (1958–59), and eventually built a second generation of Busby Babes, including George Best and Denis Law, that ten years later won the European Cup by beating two-time winners Benfica. Bobby Charlton and Bill Foulkes were the only two crash survivors who lined up in that team. A fund for dependents of victims of the crash was established in March, and chaired by the Chairman of the FA, Arthur Drewry. The fund had raised £52,000 (equivalent to £1.19 million as of 2018) by the time of its disbursement in October 1958. Also unveiled that day was a memorial to the members of the press who died at Munich, which consisted of a bronze plaque that named the eight lost journalists. It was unveiled by Munich survivor Frank Taylor on behalf of the Football Writers' Association. The original plaque was stolen in the 1980s and replaced by a replica now behind the counter in the press entrance. 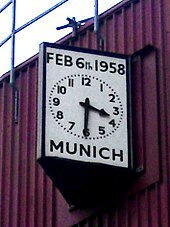 The final memorial was the Munich clock, a simple two-faced clock paid for by the Ground Committee and attached to the south-east corner of the stadium, with the date "6 Feb 1958" at the top of both faces and "Munich" at the bottom. The clock has remained in the same position since it was first installed. 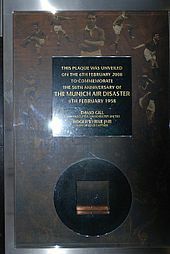 The clock was unveiled on 25 February 1960 by Dan Marsden, the chairman of the Ground Committee. When the stadium was renovated in the mid-1970s, the plaque had to be moved from the directors' entrance to allow the necessary changes. 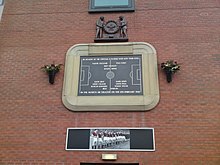 The plaque could not be removed without damaging it, so the old memorial was walled up within the Main Stand and a new memorial was made, simpler than the original, now consisting simply of a slate pitch with the names inscribed upon it, and installed in 1976. A third version of the memorial, more like the original than the second in that it included the stands around the slate pitch and the figures above it, was installed in 1996, coinciding with the erection of the statue of Matt Busby, who had unveiled the original memorial. This third version was constructed by stonemasons Mather and Ellis from Trafford Park, and the second was put into storage. It is currently awaiting new display panels before being placed into the club museum's Munich display. The third plaque and the statue of Busby were originally on the north side of the East Stand, but the statue was moved to the front of the East Stand and the plaque to the south side of the stand after the stand's expansion in 2000. There are also two memorials in Germany. First, in the Munich suburb of Trudering, on the corner of Karotschstraße and Emplstraße, there is a small wooden memorial depicting Jesus on the Cross, decorated by a stone trough filled with flowers. The trough bears a plaque with the inscription: "Im Gedenken an die Opfer der Flugzeugkatastrophe am 6.2.1958 unter denen sich auch ein Teil der Fußballmannschaft von Manchester United befand, sowie allen Verkehrstoten der Gemeinde Trudering" (In memory of the victims of the air disaster of 6 February 1958 including members of the football team of Manchester United as well as all the traffic victims from the municipality of Trudering). On 22 September 2004, a dark blue granite plaque set in a sandstone border was unveiled in the vicinity of the old Munich Airport on the corner of Rappenweg and Emplstraße, just metres from the wooden memorial. With a design in the shape of a football pitch, it reads, in both English and German, "In memory of all those who lost their lives here in the Munich air disaster on 6 February 1958". Underneath is a plaque expressing United's gratitude to the municipality of Munich and its people. The new memorial was funded by Manchester United themselves and the unveiling was attended by club officials, including chief executive David Gill, manager Alex Ferguson and director Bobby Charlton, a survivor of the disaster himself. On 24 April 2008, the Munich city council decided to name the site where the memorial stone is placed "Manchesterplatz" (Manchester Square). On the 57th anniversary of the crash, 6 February 2015, Sir Bobby Charlton and FC Bayern Munich chairman Karl-Heinz Rummenigge opened a new museum exhibit commemorating the disaster at the German club's stadium, the Allianz Arena. There is a small display of artefacts in the Majestic Hotel, where the team stayed after the match. These include a menu card signed by 14 of the players, including the eight who were killed, a photograph taken at the meal and a match ticket. The menu card was acquired by the then British ambassador to Yugoslavia and was auctioned by his son in 2006. In late 1997, John Doherty (a former United player who had left the club shortly before the disaster) approached club chairman Martin Edwards on behalf of the Manchester United Former Players' Association to request a testimonial for those victims of the Munich disaster – both the survivors and the dependants of the ones who were lost. Edwards was hesitant, but a benefit match was eventually sanctioned for a date as close to the 40th anniversary of the disaster as possible. Red Star Belgrade and Bayern Munich were touted as possible opponents for the match, and fans purchased tickets without the opponents even having been decided. In the midst of the preparations, former United player Eric Cantona, who had retired from football to pursue a career in film in 1997, expressed an interest in returning to Manchester United for a farewell match. Edwards took the opportunity to combine the two events into one. Due to Cantona's acting career, his schedule meant that he would not be available in February and the match was moved to 18 August, with the opposition to be a European XI chosen by Cantona. 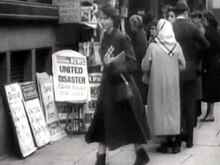 Martin Edwards was criticised for turning the match into a publicity stunt, while Elizabeth Wood, the divorced wife of Munich survivor Ray Wood, compared the treatment of the Munich victims to that of "dancing bears at the circus". Nevertheless, the match earned £47,000 for each of the victims' families, while Eric Cantona recouped over £90,000 in expenses directly from the testimonial fund, rather than from the club. The club has also received criticism from some quarters for its poor treatment of the survivors: Johnny Berry was forced to leave the flat he rented from the club to make way for a new player. On 7 February 1998, United played Bolton Wanderers at Old Trafford in the Premier League a day after the 40th anniversary of the disaster. The match kicked off at 3:15 pm to allow a minute's silence to be observed at 3:04 pm. Representatives from both teams laid floral tributes to those who lost their lives, with crash survivor and United director Bobby Charlton joined by Bolton president Nat Lofthouse in leading out the two teams. 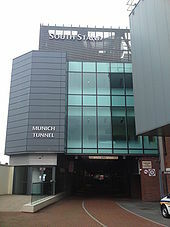 Old Trafford's Munich Tunnel, renamed in 2008 on the 50th anniversary of the disaster. On 6 February 2008, the England national football team took on Switzerland at Wembley Stadium. Before the game, pictures of the players who lost their lives at Munich were displayed on big screens, and England players wore black armbands. There was also a tribute to the Busby Babes in the match programme. Originally, a minute's silence was not to have been observed on the day, due to the Football Association's fears that the silence would not be respected by fans of Manchester United's rivals; however, they agreed that a minute's silence should be held. In the event, it was generally well-observed, but a small number of supporters made whistles and cat-calls and the referee cut the silence short after less than 30 seconds. Minute silences were also observed at the Northern Ireland, Wales and the Republic of Ireland games. On 10 February 2008, at the derby match between Manchester United and Manchester City at Old Trafford, both teams were led onto the pitch by a lone piper playing "The Red Flag", and the managers – Alex Ferguson and Sven-Göran Eriksson – each laid a wreath in the centre circle. This was followed by a minute silence, which, despite previous concerns, was respected by all the fans. Kevin Parker, secretary of Manchester City's supporters club, had originally suggested a minute's applause instead of a minute's silence, so as to drown out anyone who would disrupt the silence, but this was rejected by the Manchester United management as inappropriate. United played in strips reminiscent of those worn by the 1958 team, numbered 1–11 with no advertising on the front or players' names on the back, while City removed sponsors' logos from their kit and the image of a small black ribbon was heat pressed onto the right shoulder; both teams wore black armbands in tribute to the victims of the Munich disaster. Manchester City won 2–1 thanks to first half goals from Darius Vassell and debutant Benjani. Fans in attendance were given commemorative scarves – in red and white for the United fans, and sky blue and white for the City fans – which were held up during the silence. Bill Foulkes said that, if done right, the film could become a "tribute to the Busby Babes which could be seen for generations to come"; however, he expressed concerns about the accuracy of the film, given the filmmakers' lack of first-hand sources about what actually happened in Munich. Fellow survivor Harry Gregg was more concerned about the portrayal of the players, particularly those who died, and whether their families' feelings would be respected. John Doherty, a player who had left United only a few months earlier, was less restrained, saying that "the only reason anyone would want to make a film like this is to make money" and that "while there may be a slight hint of truth in the film, it will be mainly untruths... Unless you were there, how could you know what conversations took place?". On 10 January 2006, the BBC showed a drama/documentary retelling the story in the series Surviving Disaster. The programme was met with criticism from former United winger Albert Scanlon, who claimed that it was full of inaccuracies despite the production having consulted him about the content of the documentary. Errors in the programme included the depiction of Jimmy Murphy giving a pre-match team talk in Belgrade, despite him being in Cardiff at the time, and the plane being shown as only half full when nearly every seat was occupied. The Canadian TV series Mayday / Air Crash Investigation covered the crash in episode 77 (season 11, #5), first broadcast in December 2011. The episode covers the background of the flight, then investigates what caused the fatal crash. The University of Salford honoured Munich victim Eddie Colman by naming one of its halls of residence after him. Colman was born in Salford in 1936. There is also a network of small roads in Newton Heath named after the players who lost their lives in Munich, including Roger Byrne Close, David Pegg Walk, Geoff Bent Walk, Eddie Colman Close, Billy Whelan Walk, Tommy Taylor Close and Mark Jones Walk. Among those roads is an old people's home named after Duncan Edwards. Edwards was also honoured with street names in his home town of Dudley; there is a small close off Stourbridge Road named Duncan Edwards Close,. and in 2008, the Dudley Southern Bypass was renamed Duncan Edwards Way. The road bridge over the Luas tram line at Fassaugh Road, Cabra, Dublin 7 is named after Liam Whelan. ^ Aircraft with tailwheel undercarriages have the main undercarriage – about which the aeroplane rotates on take-off – positioned ahead of the aircraft's centre of gravity, allowing the aircraft to be flown off by application of up-elevator should deceleration be applied to the mainwheels on take-off when close to flying speed. On aircraft with a nosewheel, the main wheels are positioned behind the centre of gravity, causing a nose-down moment (force) should undue drag occur at the mainwheels, even if the nosewheel is already off the ground. This nose-down force reduces the elevator authority and makes it more difficult to keep the nosewheel off the ground, whereas the tailwheel undercarriage aeroplane already has its tailwheel off the ground at this point, and applying up elevator will usually lower the tail sufficiently for the aircraft to lift-off. On the nosewheel-equipped aircraft, the additional drag of the nosewheel in the slush reduces speed even more, as once the mainwheels have entered slush and initiated a downward force on the nose, the aeroplane has three wheels in contact with the slush, rather than just two. The tailwheel-equipped aeroplane upon entering slush may be 'hauled off' at close to safe flying speed, whereas the nosewheel one may be prevented from reaching it, or have its speed reduced by the additional drag of the nosewheel. As the slush drag further slows the aeroplane, this can make it impossible to raise the nosewheel off the runway, so the aircraft is unable to rotate. On a tailwheeled aircraft, the slush drag force is usually insufficient to prevent rotation, providing sufficient airspeed is reached, whereas on a nosewheeled aeroplane, it may force the nosewheel back onto the runway, or, depending on the airspeed achieved, even prevent it from being raised at all. In the Munich case, the drag of the slush slowed the Ambassador – which had twin-wheeled nose and mainwheel undercarriage units – sufficiently to make take-off impossible, while insufficient runway remained for the aircraft to be stopped safely. ^ Video: Britain Mourns. Soccer Champs Die In Plane Crash, 1958/02/10 (1958). Universal Newsreel. 1958. Retrieved 20 February 2012. ^ "UEFA Champions League – History". UEFA. Retrieved 24 April 2011. ^ a b White, p. 105. ^ Crick et al., p. 39. ^ Crick et al., p. 46. ^ a b White, p. 119. ^ Woodley, Charles (2006). History of British European Airways 1946–1974. Barnsley: Pen & Sword Aviation. p. 182. ISBN 1-84415-186-7. ^ "No. 36534". The London Gazette (Supplement). 30 May 1944. p. 2479. ^ "No. 36830". The London Gazette (Supplement). 8 December 1944. p. 5627. ^ "No. 38323". The London Gazette (Supplement). 15 June 1948. p. 3514. ^ "No. 39669". The London Gazette (Supplement). 14 October 1952. p. 5392. ^ "No. 35343". The London Gazette. 11 November 1941. p. 6507. ^ "No. 35747". The London Gazette (Supplement). 16 October 1942. p. 4489. ^ "No. 36033". The London Gazette (Supplement). 2 June 1943. p. 2460. ^ "No. 36108". The London Gazette (Supplement). 27 July 1943. p. 3384. ^ "No. 36165". The London Gazette (Supplement). 10 September 1943. p. 4018. ^ a b Morrin, p. 98. ^ a b Barnes et al., p. 16. ^ a b Morrin, p. 108. ^ a b c Morrin, p. 109. ^ a b Morrin, p. 110. ^ a b Morrin, p. 113. ^ "The Munich air disaster: a timeline". BBC Manchester. 19 March 2008. Retrieved 12 October 2008. ^ a b c Morrin, p. 115. ^ "Stewardess who saved lives at Munich". Hounslow Chronicle. 5 February 2008. Retrieved 14 April 2013. ^ "The 21st Survivor". Munich58.co.uk. Archived from the original on 28 August 2008. Retrieved 11 January 2009. ^ Leroux, Marcus (30 January 2008). "Captain James Thain cleared of blame after the thawing of hostilities". The Times. London. Retrieved 11 January 2009. ^ Barnes et al., p. 66. ^ "Busby Babe loses battle against cancer". BBC News. 2 September 1998. Retrieved 10 January 2009. ^ "Busby Babe Bill Foulkes dies, aged 81". BBC News. 25 November 2013. Retrieved 25 November 2013. ^ "Kenny Morgans: Ex-Man Utd player and Munich survivor dies". BBC Sport. 18 November 2012. Retrieved 18 November 2012. ^ "Busby Babe Albert Scanlon dies". Manchester Evening News. 22 December 2009. Retrieved 23 December 2009. ^ "Busby Babe dies". BBC News. 7 March 1999. Retrieved 10 January 2009. ^ Wilson, Bill (4 February 2008). "Waiting for news from Munich". BBC News. Retrieved 10 January 2009. ^ "1969: Matt Busby retires from Man United". BBC News. 14 January 2008. Retrieved 11 January 2009. ^ The Busby Babes. Retrieved 14 April 2015. ^ Glanville, Brian (22 July 2002). "Obituary: Frank Taylor". The Guardian. London. Retrieved 11 January 2009. ^ a b "Gregg's 'greatest save' – Munich remembered". BBC News. 4 February 2008. Retrieved 7 October 2008. ^ death notice in Flight International. 14 August 1975, p. 210. Retrieved 4 July 2015. ^ Barnes et al., p. 17. ^ a b Morrin, p. 155. ^ Marking club's 125-year history The Advertiser, 12 March 2012. ^ Graves, Steve (17 October 2016). "Liverpool and Manchester United: the times the teams and fans put rivalry aside". Liverpool Echo. Trinity Mirror Merseyside. Retrieved 7 February 2018. ^ a b c Morrin, p. 146. ^ a b c Endlar, Andrew. "1957/58". StretfordEnd.co.uk. Retrieved 10 January 2009. ^ Richards, Jack (7 February 1958). "World Laments Manchester Loss". The Vancouver Sun. p. 22. Retrieved 23 April 2011. ^ "1968: Manchester United win European Cup". BBC News. 29 May 1968. Retrieved 10 January 2009. ^ a b c d e f g "The Munich Plaque at Old Trafford". Munich58.co.uk. 2005. Retrieved 12 October 2008. Transcribed from a 2005 issue of Manchester United fanzine Red News. ^ a b White, John (2007). The United Miscellany. London: Carlton Books. p. 14. ISBN 978-1-84442-745-1. ^ "The Memorial at Munich Airport". Munich58.co.uk. Retrieved 12 October 2008. ^ a b "New memorial to be unveiled at Munich Airport". Munich58.co.uk. 2004. Retrieved 12 October 2008. ^ "Photo 3 of 13". Munich58.co.uk. September 2004. Retrieved 12 October 2008. ^ "Straßenneubenennung Manchesterplatz". muenchen.de. City of Munich. Retrieved 1 June 2009. ^ Thomas, Nathan (6 February 2015). "Sir Bobby opens Bayern's Munich exhibit". Manchester United F.C. Retrieved 8 February 2015. ^ "Babes' autographs fetch £12,000". BBC News. 4 October 2006. Retrieved 31 July 2013. ^ "John Doherty". The Independent. Independent Print. 15 November 2007. Retrieved 13 November 2011. ^ Syed, Matthew (4 February 2008). "Survivors who felt left behind by club's rise from the ashes". The Times. London. Retrieved 29 August 2011. ^ Hodgson, Guy (7 February 1998). "Football: Bolton add to solemnity of occasion at Old Trafford". The Independent. London: Independent Print. Retrieved 1 April 2015. ^ a b "Football honours Munich victims". BBC Sport. 6 February 2008. Retrieved 11 October 2008. ^ "Minute's silence for Munich crash". BBC Sport. 28 January 2008. Retrieved 12 October 2008. ^ "No silence to honour Munich crash". BBC Sport. 16 January 2008. Retrieved 18 January 2008. ^ Rudd, Alyson (7 February 2008). "Silent majority drowned out as tributes cut short". The Times. London. Retrieved 8 February 2008. ^ Glendenning, Barry (6 February 2008). "Minute-by-minute: Republic of Ireland v Brazil – live!". The Guardian. Retrieved 12 December 2011. ^ "Fans respect silence for Munich". BBC Sport. 10 February 2008. Retrieved 12 October 2008. ^ Bostock, Adam (22 January 2008). "United reject applause idea". Manchester United F.C. Retrieved 12 October 2008. ^ Bartram, Steve (8 February 2008). "Derby kit unveiled". Manchester United F.C. Retrieved 12 October 2008. ^ Sanghera, Mandeep (10 February 2008). "Man Utd 1–2 Man City". BBC Sport. Retrieved 12 October 2008. ^ Hibbs, Ben (10 February 2008). "Moving silence at OT". Manchester United F.C. Retrieved 12 October 2008. ^ "History". theflowersofmanchester.co.uk. Retrieved 26 April 2011. ^ "Irish Blood, English Heart (CD2) (Single)". Amazon.com. Retrieved 11 October 2008. ^ "Live at Earls Court (Specially Packaged) (Limited Edition)". Amazon.com. Retrieved 11 October 2008. ^ Clarke, Betty (26 May 2006). "The Futureheads, News and Tributes". The Guardian. London. Retrieved 11 October 2008. ^ a b c d Hince, Paul (22 April 2005). "Munich film row". Manchester Evening News. Manchester. Retrieved 10 October 2008. ^ "Survivor's anger over Munich crash film". Manchester Evening News. 7 January 2006. Retrieved 11 October 2008. ^ "Munich Aircrash: Disaster Season". Yesterday. UKTV. Retrieved 24 April 2011. ^ "MUTV Schedule: 6 Feb". Manchester United F.C. 5 February 2008. Retrieved 11 October 2008. ^ "TV review: Doctor Who; United". The Guardian. 24 April 2011. Retrieved 24 April 2011. ^ "Jim White: Jimmy Murphy's central part in the resurrection of Manchester United is the key reason to watch United". The Daily Telegraph. 22 April 2011. Retrieved 22 April 2011. ^ "Prix Europa 2011: Nominees". Prix Europa. Archived from the original on 29 October 2011. Retrieved 16 September 2011. ^ "Sir Matt Busby's son 'disgusted' at United TV film". BBC. 24 April 2011. Retrieved 25 April 2011. ^ "Eddie Colman and John Lester Courts". University of Salford. Retrieved 13 October 2008. ^ Conn, David (21 April 2010). "FC United homage to history as they prepare for future at Newton Heath". The Guardian. Retrieved 4 January 2011. ^ "Duncan Edwards- 50 years on". Dudley News. 30 January 2008. Retrieved 3 July 2011. ^ "Duncan Edwards Way given go-ahead". dudley.gov.uk. 24 October 2008. Archived from the original on 10 November 2010. Retrieved 3 July 2011. ^ Bradley, Steve (29 December 2008). "New road signs have been installed to honour Dudley-born football hero Duncan Edwards". Birmingham Mail. Trinity Mirror Midlands. Retrieved 3 July 2011. Barnes, Justyn; Bostock, Adam; Butler, Cliff; Ferguson, Jim; Meek, David; Mitten, Andy; Pilger, Sam; Taylor, Frank OBE; Tyrrell, Tom (2001). The Official Manchester United Illustrated Encyclopedia. London: Manchester United Books. ISBN 0-233-99964-7. Connor, Jeff (2007). The Lost Babes. London: HarperSport. ISBN 978-0-00-720808-1. Crick, Michael (1990). Manchester United – The Betrayal of a Legend. and Smith, David. London: Pan Books. ISBN 0-330-31440-8. Hall, David (2008). Manchester's Finest. London: Bantam Press. ISBN 978-0-593-05922-7. Middleton, Don (April 1982). "Airspeed's elegant Ambassador – Part 3". Aeroplane Monthly. Morrin, Stephen R. (2007). The Munich Air Disaster. Dublin: Gill & Macmillan. ISBN 978-0-7171-4110-4. Stewart, Stanley (1987). Air Disasters. London: Guild Publishing. ISBN 0-09-956200-6. 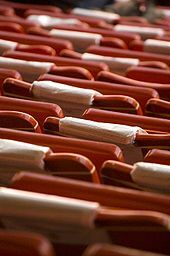 Wikimedia Commons has media related to Munich air disaster, 1958. "Munich – Second Report Disputed". Flight International. 2 November 1967.